We develop, design and provide a unique patented technology to harvest the limitless energy of the ocean. the limitless wind and wave energy of the ocean. "Of the estimated 400GW offshore wind market by 2050, Floating Power Plant is targeting 20GW, corresponding to €50bn potential revenue." Offshore wind installations are moving further away from the shore and into deeper waters, due to the scarce availability of wind sites, creating a need for floating foundations. The P80 is a floating platform that hosts a single wind turbine ranging from 5 MW to 8 MW. The platform integrates 2 MW to 3.6 MW wave power dependent on the wave resource. The platform is moored at a single point allowing the P80 to passively rotate to face the waves securing a safe offshore boat landing and transfer aft of the platform. The platform rotation is secured via the high wave absorption of 60-80% of the inherent energy in the waves. Offshore hybrid to generate power to the grid. Value to 2050 of the 20GW target market. 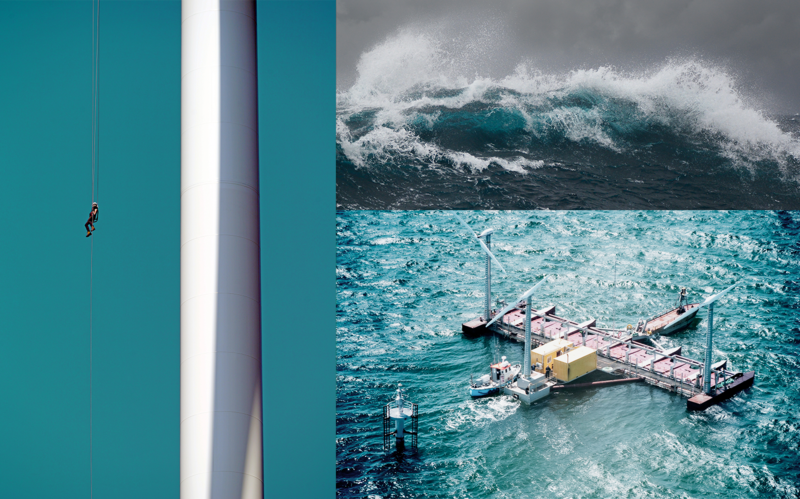 The only offshore-proven and grid-connected combined floating wind and wave device. Between 2008 and 2013 Floating Power Plant successfully completed four grid connected tests on a half-scale prototype at Vindeby offshore wind turbine park, Denmark. "The UK is Floating Power Plant's short term market, allowing us to commercialise the technology and then expand into the global market."